Hey everyone! Today I wanted to share a polish with you that is my current OBSESSION. Seriously, just stop. Can you see the gorgeous layers of red glitter and glassy black? 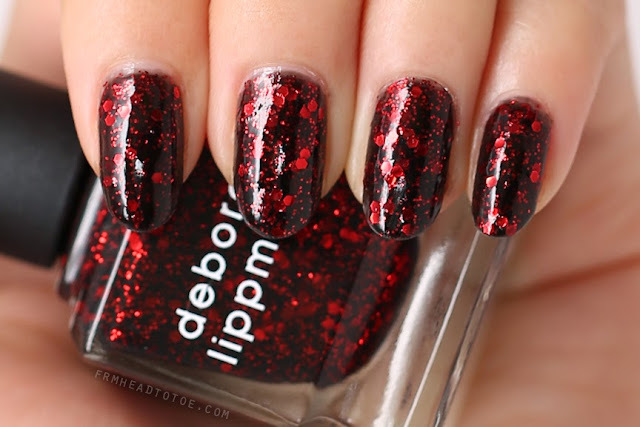 There is something so perfectly vampy about it which makes Ruby Red Slippers from Deborah Lippmann perfect for the Halloween season. More eye candy below! Due to an impromptu Gilt purchase (It's a more luxury sample sale site which I've been a part of even before Hautelook. My invite is here if you haven't signed up with them before!) 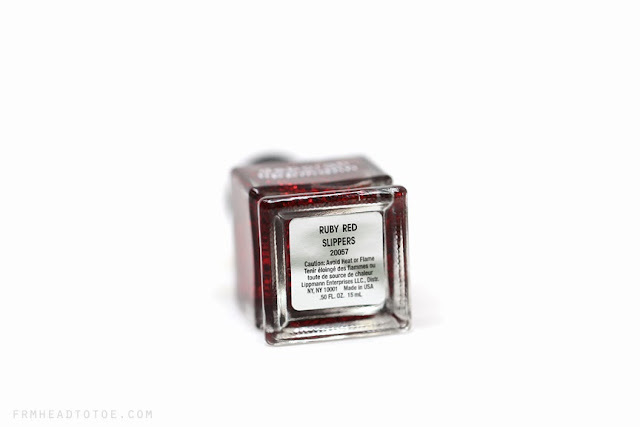 I picked up a pack of 5 DL glitters for $55 including Ruby Red Slippers which I was most excited to try. I've heard so many tales online lauding the beauty of Deborah Lippmann but at $19 per bottle I wanted to wait for a coupon or sale before I splurged. I have no regrets! This shade is a stunner. Application gave me no problems at all although it has a typical, skinnier cylindrical brush. Here I used a base of OPI Nail Envy, 4 thin coats of Ruby Red Slippers, and Seche Vite to give it extra shine. This was actually good at 3 coats but since the black base is semi sheer, I wanted to see if it would gain more depth with an extra layer. I personally love the final look and am impressed with how easily the glitter spread across the nail without being too textured or patchy. I've already gotten compliments from random people from wearing this polish and, I'm not kidding, in natural sunlight this literally looks like rubies scattered in stone. Definitely my favorite nail polish I've worn in a long time! I can't wait to see if the other glitters are as impressive as this one. If interested, you can pick this up at Bloomingdales, Nordstrom, Neiman Marcus, and Sephora. 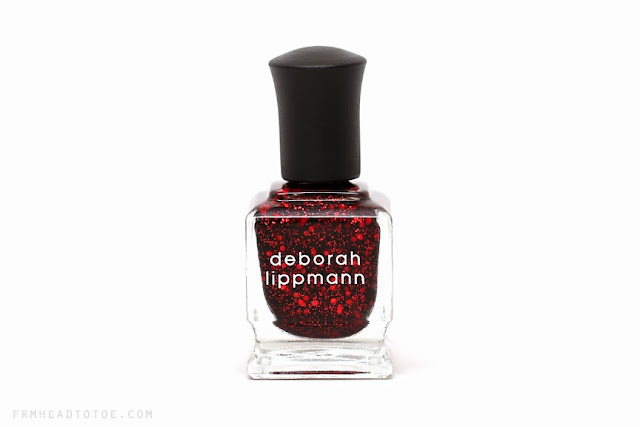 Readers, have you tried Deborah Lippmann nail polish? What do you think of glitter polish? Let me know in the comments! I love glitter polishes but have never found one that has a different base polish from the glitter that ends up so opaque! Wow, I've never really wanted to spend money on Deborah Lippmann polishes since they are so expensive, but I may have to give in to this one. 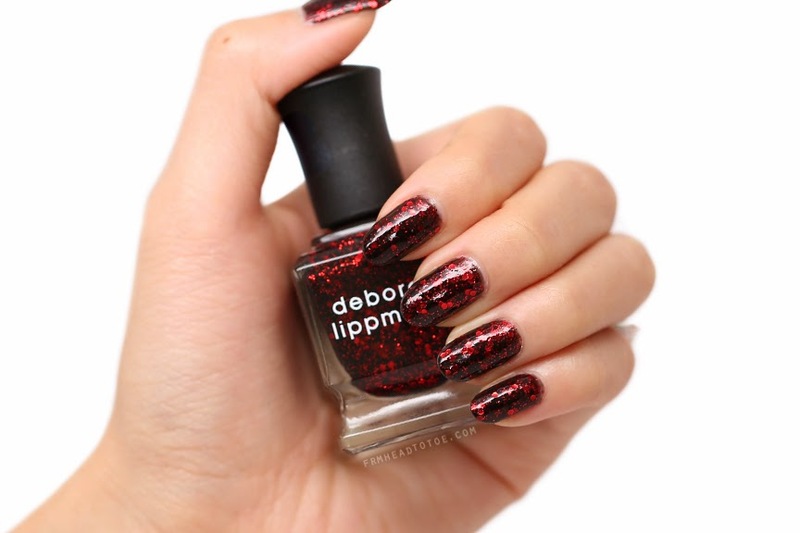 It really does give off that vampy vibe and is stunning for Fall and holiday time. Loveeee! That would definitely be perfect for Halloween! So damn gorgeous color i am so gonna buy this. Hey Stephanie, a nice, cheap dupe for this is from a brand called Spoiled! The color is called Ants In My Pants. It can be found at CVS, hope this helps! September 2013 Beauty Favorites + Giveaway!